‘Interstellar’ is a sweeping, audacious effort by a filmmaker whose reach inevitably exceeds his grasp. But how can you not applaud its sheer sense of scale, drama, and fearlessness? I’m going with three-and-a-half out of five. Now forget everything you’ve read and heard and go experience it for yourself! Storytelling is a manipulative art form, and by relentlessly plying plot upon plot and event upon event, Nolan slows Interstellar down — even as the narrative itself attains hyperspeed. And this feeling of an immeasurably long film — of thinking back in the third act to an opening scene and feeling like it happened many hours ago, many episodes ago, many seasons ago — is what gives Interstellar its epic breadth. And it is this process of discovery that is magnificent, complex and a true testament to Nolan’s visionary genius. McConaughey is brilliant but Hathaway is a little unconvincing. The terminologies and mathematical formulae might confound some, but you will nonetheless be dazzled. Subtexts abound: the individual vs. the good of mankind, love’s overarching influence over time and space and so on. This intergalactic extravaganza is clearly in a class by itself. If you’re looking for a moderately smart, and a ‘differently executed’ movie in the commercial Hollywood space, you’ll dig this movie. Interstellar is two different movies trying to be one. The first film features the space stuff, where the protagonist Cooper is on a mission to save the human race. It’s thrilling, it’s imaginative, it’s gorgeous and it always keeps you on the edge of your seat. 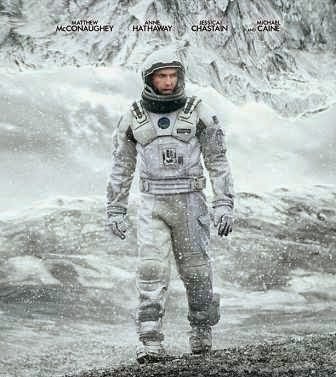 The second movie features the protagonist’s children on Earth, hamming, stuck in a cringe-inducing story full of mawkish clichés, doing things no sane adult would do.Interstellar thus showcases both the best and the worst of Nolan.